Assembly Speaker Toni Atkins (D-San Diego) has been honored by the California Association for Nurse Practitioners as the 2014 Nurse Practitioner Advocate of the Year. 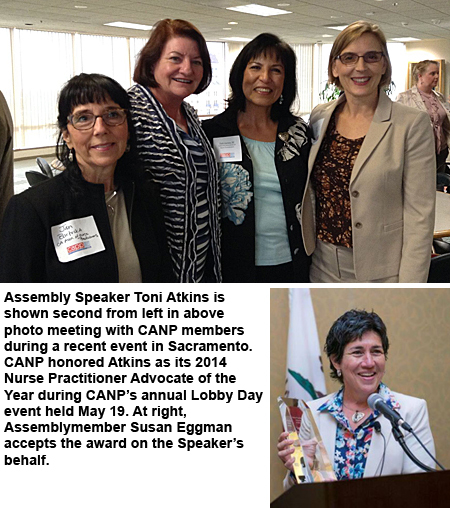 The announcement was made during CANP’s annual Lobby Day event held May 19 in Sacramento. Speaker Atkins has a long history of support for women's health. Previous to entering elected office, she served as director of clinic services at WomanCare Health Center in San Diego, which provided a broad range of women's health services to low income and uninsured women. Since being elected to the Legislature, she has remained committed to women’s health issues and in 2013 carried legislation (Assembly Bill 154, Chapter 662, Statutes of 2013) that allows nurse practitioners and physician assistants to perform first trimester abortions. In addition to the expansion of health care access for women, AB 154 acknowledged the vital role that nurse practitioners play in delivering quality health care and removed some of the institutional barriers that prevent NPs in California from practicing to the full extent of their education, experience and expertise. With Speaker Atkins unable to attend the award presentation, the honor was accepted on her behalf by Assemblymember Susan Eggman (D-Stockton), a former Army combat medic and – along with Senator Ed Hernandez (D-West Covina) – the co-author of Senate Bill 323, which would remove physician supervision requirements for nurse practitioners in California. The NP Advocate of the Year honor has been awarded just once previously, to then-Senator Gloria Negrete-McLeod in 2011. Negrete-McLeod was the author of SB 294 (2009), which proposed to expand scope of practice limits on NPs in California. NPs are advanced practice registered nurses who have pursued higher education, a master’s or doctorate degree, and certification as an NP. They play an important role in the health care delivery system and provide care in a variety of settings such as hospitals, community clinics, and private practice settings, including in many medically underserved communities throughout the state. Studies published in the Journal of American Medicine and by the Rand Corp. show that NPs provide quality of care, health outcomes and patient satisfaction equal to physicians. A 2014 report by the Bay Area Council concluded that granting full practice authority to nurse practitioners is “one of the most effective steps” California can take to increase the supply of primary care providers while maintaining high quality health care and driving down costs. CANP is the voice for more than 18,000 nurse practitioners in the Golden State, uniting nurse practitioners in an exchange of ideas, practice advice and development of professional assets while working to advance the nurse practitioner profession statewide.